Air temperature: Destin’s average highs (in Fahrenheit) look something like this: 60s in January and February; 70s in March and April; 80s in May through October (with temperatures peaking in the 90s around July); 70s in November; 60s in December. 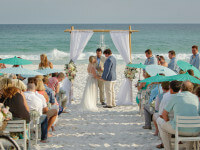 This gentle trend in climate helps make Destin, Florida beach weddings a possibility almost anytime of year. Precipitation: Destin’s maximum average precipitation falls in June, July and August, but keep in mind that the area still manages to average some-340 days of sunshine annually. Regardless, we recommend for all couples a “rain plan,” which may include taking advantage of Hilton Sandestin Beach’s elegant indoor spaces. Save the date: Area weather patterns make May, June and October especially attractive for Destin beach weddings. We suggest you target a minimum of nine months in advance to secure your date and begin the planning process, particularly for events during peak months. Timing and the elements: Beyond the beauty of a sinking-sun backdrop for your ceremony and photos, there are practical reasons to time your Destin beach wedding with the sunset: You’ll elude the heat of the day and intense sunlight that makes squinting unavoidable. In addition to sunset times, your Hilton Sandestin Beach Wedding Coordinator can provide high and low-tide times – and sound packages to ensure that your guests hear your music and vows above the lapping waves. 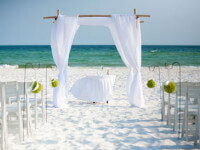 Privacy: Couples often wonder how intimate their ceremonies will be considering that Florida’s beaches are public. 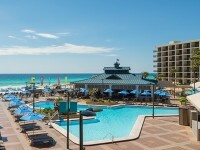 Note that Hilton Sandestin Beach implements a protocol for all weddings that includes staffing security officers and sectioning off private events to ensure our couples as much privacy as possible. License to wed: Before marrying in the state of Florida, couples must obtain a marriage license (issued by Florida’s Clerks of Court). View information on requirements and fees here.